When the announcement of Childish Gambino (along with Diplo) being one of the headliners of Brookfest 2014 was made, it was surprising to see the entire backlash with the selection. Some students didn’t know who Gambino was and blasted the USG for not having a more popular act (because Justin Timberlake and Jay-Z are apparently known for their shows at colleges). Other students are sick of having rappers appear year after year and wanted a rock band to come to SBU (despite Grouplove’s impressive show of indie rock last year). In the long run, Gambino may have been a very logical choice: he is not a huge star but has a passionate cult following, most of his fans are young college students who appreciate his alternate style of music, and his presence is more relatable to the audience instead of being larger than life. Compared to Ludacris last year, Childish Gambino is a major improvement on the part of having someone new, relevant, and able to connect with a college crowd. Gambino, currently on his Deep Web tour, performed in front of a live band and video screen that looked like a fancy penthouse owned by Bruce Wayne. His power levels were well over 9,000 (you’re welcome, “Dragonball Z” fans) as he hopped around stage in short shorts and a sweater. 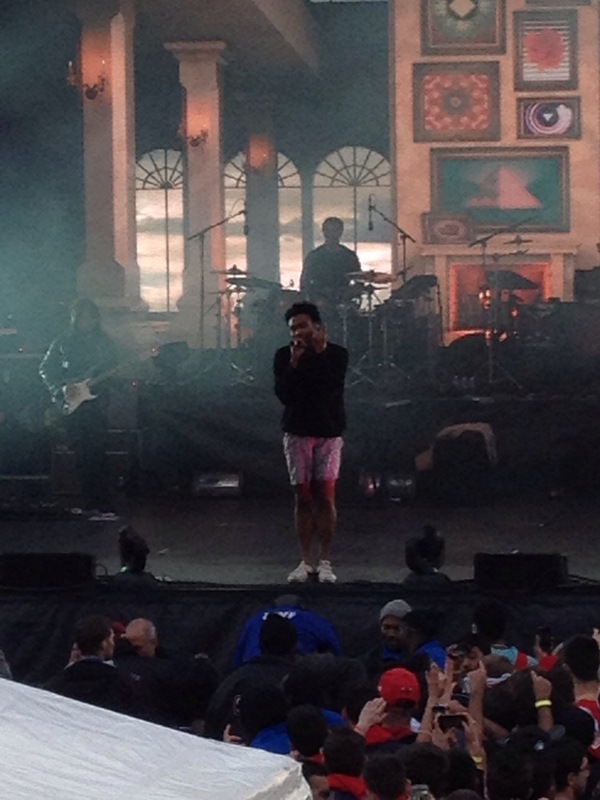 Gambino moved and grooved to his funky live band with full control over the hyped Stony Brook crowd. Most of the show had Gambino playing cuts of his recent album, “Because the Internet,” which actually had a lot more bounce and fun to them than on the album itself. Tracks like “WORLDSTAR” and “Sweatpants” and especially opener “Crawl” turned into fist pumping club anthems as the crowd shook LaValle Stadium. When “Earth: The Oldest Computer” started with it chants of wanting to live forever and its hammering bass, it seemed like Diplo was getting shown up before he even took the stage. More so, the smoother, R&B flavored jams like “Telegraph Ave” and “The Worst Guys” had a bit more energy and allowed Gambino to shuck and jive as the crowd matched his vibe. Of course Gambino’s more popular songs, like “3005,” “Heartbeat,” and “Freaks and Geeks,” were treated to extreme fanfare. “3005” was the peak of the show, but the closer “Bonfire” had the most audience participation. Nearly the entire crowd (including this writer) was singing to Gambino’s boasting anthem as Gambino himself shouted his lungs out. Despite his somewhat somber demeanor onstage, Gambino looked to be having the time of his life onstage bouncing off the edges of the stage. So to all of the students who missed the opportunity to see Gambino, this writer won’t judge your taste in music or preference for a live show (personally, I didn’t stay for Diplo due to a lack of interest in the artist). But this was a very entertaining show full of spirit and life. Granted, the sound of the band overtook Gambino’s voice on occasion, but Gambino still worked around it. He has a passion and dedication to his craft that he wants to present in full force live. That craft was brought front and center to the students at Stony Brook, so here’s to 6 albums and a biopic (you’re welcome “Community” fans). This entry was posted in Uncategorized and tagged Because the Internet, Childish Gambino, live, Stony Brook University. Bookmark the permalink. It’s hard to buy the fact that “Everyday Robots” is Damon Albarn’s first official solo album. In Blur, his clever songwriting was the spirit of Britpop that bit its lip at surrounding English culture. While the Gorillaz were comprised of cartoon characters on paper, Albarn was behind the scenes building freaky sounds that merged alternative rock, world music, electronic music, and rap to make one of the weirdest pop formulas in recent memory (over 8 million albums sold worldwide). In fact, how many people who bought the self-titled debut album of his super group The Good, The Bad, and the Queen were Blur and Gorillaz fans? No matter what he’s involved himself in, whether that be singing pop music, producing for soul legend Bobby Womack, or composing operas based on the life of Elizabethan doctor John Dee, Damon Albarn has had the spotlight on him (whether he has wanted it or not). Perhaps all of that time in the bright light has made him focus on the blackness surrounding him, because he has certainly had his share of alienation. “Everyday Robots” is the most autobiographical piece of music Mr. Albarn has created since he first (reluctantly) pinched the sound of The Stone Roses 23 years ago. Described by Albarn as “folk-soul,” electronic instruments and piano loops are mixed with African drums and chants, while Albarn lays his heart out in an aching croon. The title track that opens the record is haunting, with the ever-observant Albarn seeing others “looking like standing stones,” as we drive aimlessly or tap away at our phones. He notes his faults in a relationship as he sits alone with his record player on “Lonely Press Play.” “The Selfish Giant” roams in spacey synthesizers with Albarn “waiting for the final call,” as he notes “it’s hard to be a lover when the TV’s on.” The 7-minute “You & Me” is probably the darkest song here, where Albarn briefly sees heroin burn in tin foil as he waits to bleed out. However, another case could be made with “Hollow Pond,” where light picks of an acoustic guitar and an organ create a funeral-like mood for Albarn to mourn over his adolescence. 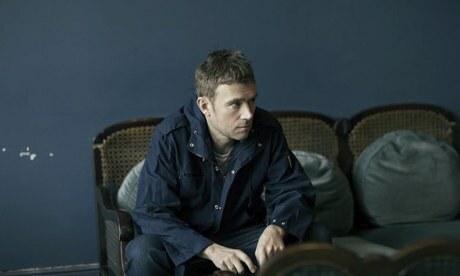 Albarn is so vivid in his lyrics that the listener could close his eyes and see Albarn sitting next to him with his head buried in folded arms. Albarn and co-producer Richard Russell have created a rich but mournful setting through the sound on this record. There are more musical elements of Gorillaz and The Good, The Bad, and the Queen here than any of the bounce Blur had, but maybe that’s the point. Albarn, who has doubted the possibility of another Blur record since their reunion in 2008, has made so many musical left turns in his career that “Everyday Robots” plays like the biography of a completely different person than the man behind “Girls & Boys.” While it would be interesting to hear that cocky wiseass comment on the pop culture trends of today, this snapshot of Damon Albarn is fascinating from beginning to end. 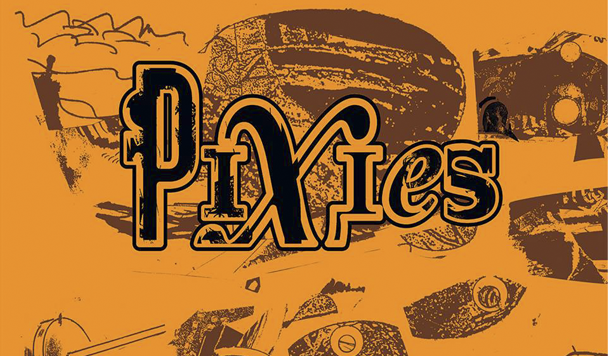 The music is modern and beautiful and the lyrics are full of dread and bare emotion, adding up to the British equivalent to Beck’s “Morning Phase,” which is just about 2 months older than this album. While this has a space-like atmosphere than Beck’s acoustic delivery, “Everyday Robots” is a fascinating look into the mind and heart of one of music’s modern renaissance men alone with his thoughts. This entry was posted in Uncategorized and tagged album review, Blur, Britpop, Damon Albarn, Everyday Robots, Gorillaz. Bookmark the permalink. It’s 1:22 PM as I’m writing this and approximately 1 hour ago, Comedy Central’s “The Colbert Report,” is probably canceled. Not because or low-ratings or poor reviews (4 Emmys, 2 Peabody awards, and a Grammy for Mr. Colbert), but because Colbert appears to be moving up in the world of late night. CBS announced that Stephen Colbert will take over “The Late Show,” after David Letterman, the man behind the desk for over 30 years, retires. Now this is big news on its own, especially considering late night television just said goodbye to another late night legend (Jay Leno) for another young upstart (Jimmy Fallon). However, this news is a bit more intriguing considering that Mr. Colbert is on a very opposite side of the late night spectrum compared to his competitors. Mr. Colbert’s show started in 2005 and came off like a satire of serious political talk shows like Fox News’ “The O’Reilly Factor.” Unlike his fellow news spoof star, Jon Stewart, Colbert was playing a character of a right wing hothead tackling today’s news. He kept a straight face sneaking in jokes about the blunders in news and politics. He was sillier than Stewart and had a bit more fun with the show, like having shows dedicated to the work of author J.R.R. Tolkien, producing (and singing) a song helmed by Jack White, and an annual concert series called “Colbchella” (a take on the popular music festival, Coachella). Many young people consider Colbert to be one of the essential presences in late night TV. 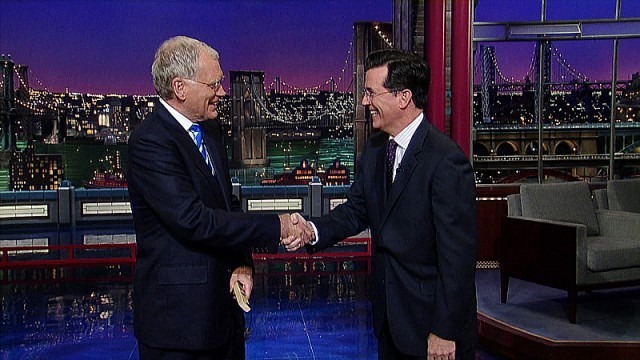 Compared to Mr. Letterman, who is the last of the old school stand-up comedian hosts from the baby boomer generation, Colbert seems like a big risk to take into late night television. Again, Letterman’s audience still consists of mostly baby boomers and he isn’t the highest rated man after 11 PM. Bringing Colbert in is a drastic change, presumably to tend to a younger demographic like NBC did when selecting Jimmy Fallon to succeed Jay Leno. Fallon is a success (for now), but the last time Leno stepped down for a host boosted by a younger demographic, ratings tanked, Leno was turned into TV’s newest villain, and Conan O’Brien ended up on TBS. Colbert is just such a different type of host that it seems like a real roll of the dice for CBS to do. I’m happy with the choice, but it will certainly be interesting to see what Comedy Central’s Edward R. Murrow look alike will do when he walks into the Ed Sullivan Theatre next year. This entry was posted in Uncategorized and tagged CBS, Colbert, Late Night, Late Show, Letterman. Bookmark the permalink. Chris Evans, the man formerly known as The Human Torch, is back playing Steve Rodgers as S.H.I.E.L.D’s star employee, Captain America. Despite the encouragement of fellow agent Natasha Romanov (Scarlett Johansson) to get out in the world, Rodgers feels alone and out of place in the 21st century. He’s trying to learn about Thai food and Nirvana while completing the various vague missions issued by S.H.I.E.L.D director Nick Fury (Samuel L. Jackson). Fury is in the midst of issuing a worldwide police force through 3 massive flying warships, which Fury describes as stopping the threat before it happens but Captain America calls fear through firearms. Cap doesn’t trust Fury, but he’s going to have to considering a mysterious assassin named The Winter Soldier attacks Fury. Accused of being involved with the plot by S.H.I.E.L.D executive Alexander Pierce (Robert Redford), Captain America is labeled a fugitive by the organization that saved his life. More paranoid than ever, Captain America must work with the sly Romanov and a former military pilot named Sam Wilson (Anthony Mackie) to discover what’s really going on behind the closed doors of his own employers. This is a plot with many moving parts, which is a big step for Marvel Studios. Thankfully, most of it locks into place and works nicely. The action is very impressive with a healthy balance of stealth, bare-knuckle brawls, and spectacular special effect-driven aerial attacks. Anthony and Joe Russo, the directors of the film, carefully balance the “politicians are evil” spy movie with the typical summer popcorn movie. Captain America only has half of the charm of Iron Man, a quarter of the emotional struggle of Hulk, and 1/100 of the power of Thor (possibly less). Fortunately, he’s played by an impressive actor in Chris Evans, who plays Cap like a conflicted man with strong morals that are constantly being dated. The dimensions that Evans added to Cap in “The Avengers” are brought up front here, and it builds great character development. Evans also has great support from Johansson, Jackson, Mackie, and Redford. Basically everyone is here to help push Captain America into the public conscience and they succeed. Granted, this movie isn’t flawless: It suffers from vertigo-inducing camera movement at times, a pretty obvious villain, and a mostly by the books ending. Redford, as great as he was in last year’s “All Is Lost,” seems to be phoning his performance in. The Winter Soldier himself is given very little character development (although his true identity is not that hard to figure out if one saw the first movie), along with Mackie’s Sam Wilson. It’s a bit frustrating because there is plenty of potential in some of these small characters. 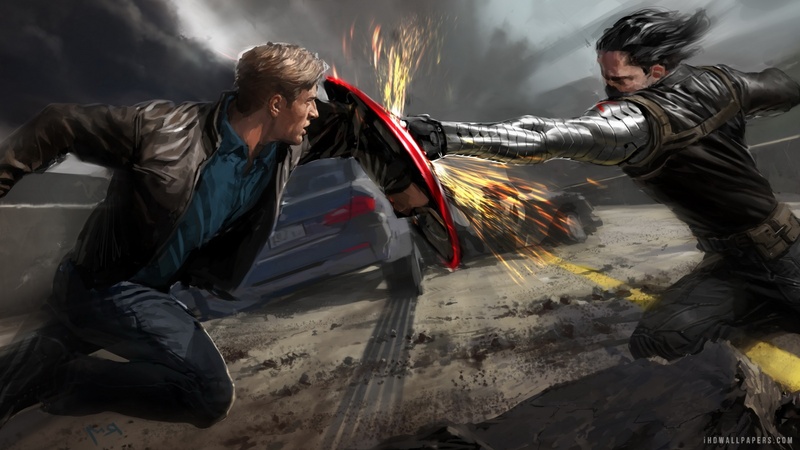 While “Captain America: The Winter Soldier” is not as smart or grown up as it would like to be, it’s still a great piece of pre-summer popcorn movie fun. It’s definitely better than its predecessor (and “Thor: The Dark World”) and also better put together by “Iron Man 3.” It’s action and plot is smarter than the average Marvel movie, though a little more wit and humor could’ve helped. The important thing is that this could’ve been worse (look what happened to the Thor sequel). Hopefully the cannon of humor will be filled by “Guardians of the Galaxy” come August, but the bar for summer movies has been set high by the man in stars and stripes. This entry was posted in Uncategorized and tagged Captain America, Marvel, movie, review, Winter Soldier. Bookmark the permalink. This past Tuesday involved class presentations on certain topics we thought were essential. One of my fellow classmates talked about the rise and fall of the social media website Myspace, while I talked about the prominence of Facebook, the largest social media website today. Although Myspace is the predecessor to Facebook, one had a better business plan to survive the changing landscape of technology (hint: it’s the one that got a movie deal). Facebook had two key elements in their triumph over Myspace in the clash for the crown of social media king. If one were to walk down any busy city street, there’s a good chance that the person would see pedestrians with their heads down looking at their phones of tablets. Companies need to understand that today’s consumers want their information mobile and easy to access at all times. In the case of Facebook vs. Myspace, Facebook has been driving toward major mobile integration since 2006. With its popular and useful mobile application, Facebook has taken their services to the smart phones and tablets because they are well aware that their users are always on the go and want easy access to a social media hub. Myspace was not as aggressive to mobile integration, which was another reason for their lack of success (compared to Facebook, at least). Myspace is a social network, but it claims to have a strong emphasis on promoting and sharing music. While that can (and has) help spread the music of unknown artists, it limits the potential of Myspace. As a social media site, there has to be a connection for all people interested in using the site. It’s great for musicians to connect to others, but how can other people connect? The success of Facebook comes from how open the site was to users. Facebook is not about promoting artists, but just connecting people. People can share and promote their business, sports team, and other various projects. If they’re not there to share a project, they can simply share themselves. Facebook allows users to connect with anyone through mutual interests, which is how normal people connect and interact through conversation. Facebook takes that idea and makes it simpler, showing what people like on their profile so that others can find mutual interests. Connecting through social media was both stripped down to a simple form, but also expanded through the open style of Facebook. Myspace appeared exclusive, while Facebook kept letting more in.